Microsoft's spanking new Outlook.com and creaking Hotmail service are experiencing prolonged outages around the world. 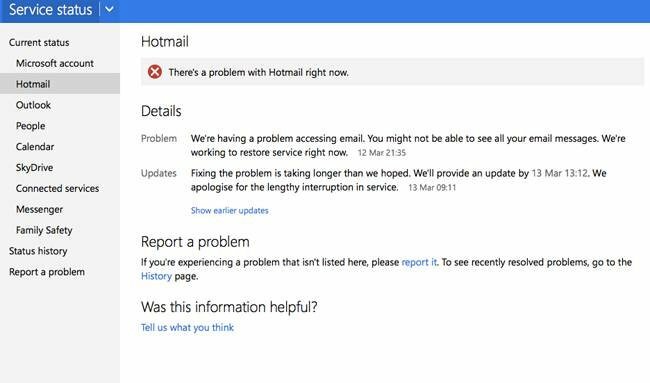 Hotmail and Outlook.com users are complaining they are either unable to access email or unable to see all their email messages. The problem seems to have initially affected cloud storage service SkyDrive, too, but this issue seems now to be solved. It should also be noted that not all Hotmail and Outlook accounts are affected. The online outage seems to have struck about 17 hours ago, based on the time stamps of Twitter users who've been complaining. Microsoft admitted a problem at 21:35 GMT last night on its service status page and this morning it said fixing the problem is taking "longer than expected." "We apologise for the length interruption in service," the company adds. Microsoft also promises an update by UK lunchtime. Hotmail is the world's largest free email service with 360 million accounts; Microsoft officially launched Outlook.com in February and intends migrating Hotmail users to the new service by this summer. Microsoft calls Outlook.com "a vision for modern email." Back in February Microsoft was slapping itself on the back, noting that 60 million people had joined Outlook.com and suggesting that this was a validation of its vision and of the brilliance of the new service. However, it's looking increasingly as though Microsoft still can't master the basics of migrating such online services: in February users of Hotmail who'd been moved to Outlook were prevented from accessing their emails. Now once again, the stream of complaints online seems to be coming primarily from Hotmail users and people are angry. Wow, Microsoft. Yet again #hotmail is down...You're making the decision about whether to switch fully to gmail or not very easy. After hotmail being down for over 6 hours it's time to move to Gmail. Been putting it off for too long.